Diapering is the most basic activity of raising a kid. No matter what happens, you have to do it three to four times a day at least. Everything else is relative with babies, pooping is not. Poop they must and deal with the diaper situation you must. So when you are a new parent, no matter where you go, what you do, you must carry a diaper bag around. Everyone does it. If you are friends with a young mommy and daddy, or someone in the family has just had a baby, we have an awesome gift idea for you. Yep, you guessed it. 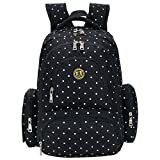 Buy them one of these gorgeous and functional diaper bags. We, at Baby Gift Ideas, have gone through the trouble of compiling this list for you. 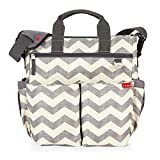 This diaper bag is made for the parents that are always on-the-go. If you are or know travelling parents that have to commute a lot, then is the perfect diaper back for you. It is multipurpose and even has a carryall tote. It stores all the baby stuff and it even has an insulated bottle sleeve to keep the milk cold. Because this diaper bag is waterproof and made out of high quality material, it can easily be wiped clean. It has got various storage compartments and has quite a capacity. You can carry it like a diaper bag, handbag or place it on a stroll. The manufacturers also offers a money back guarantee. This bag is functional as it is fashionable. It comes in three colors; gray, black and navy blue. There are as many as nine secure pockets! That is a large number of pockets meaning the bag is quite high on capacity. Best part: if you don’t like the diaper bag, you can return it for full money in 90 days. They have revamped their design. Now this diaper bag has got tote handles and a zip closure. The zipper on the top ensures that the content of the bag stays safely inside. There is an easy access tech pocket as well. 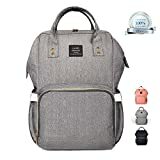 This is a multipurpose bag that primarily holds kids’ stuff but you can also use it as an adult travel or laptop bag. This bag is waterproof that makes it very handy. With waterproof bags you don’t have to worry about dirt or milk getting spilled, you can just wipe it clean. There are multiple compartments even for milk and water bottles. This 12 pockets beauty has dual features. It can be used as a conventional backpack and have even be used as a basket bag as it has stroller straps. The exterior is made of nylon with polyester inside. Since the bag has got 12 pockets, there is a pocket for virtually everything; milk bottles, mobile phone pocket, side pocket, upper and inner pockets and what not. This is quite a large bag that includes seven pockets in total; one main big compartment. Two side pockets, two outer pockets and two internal compartments. There is included a matching changing pad and stroller straps. Like our previous entry, this diaper bag also includes stroller attachments along with some extra add on grips. Also included and two accessory cases for smaller items. 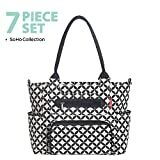 A Personal small purse and of course the diaper bag with a roomy main compartment along with several pockets. 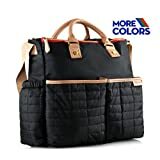 This gigantic diaper bag is made out of high quality nylon and has no less than 13 pockets! It can pretty much hold everything. This is a sort of gadget that can make your life easy as a new parent. The manufacturer offers 50 days free exchange and 185 days warranty. A solid bag that is durable, stylish and practical. 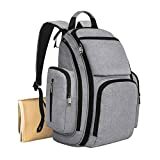 This bag impressed me because it has some practical aspects to it. 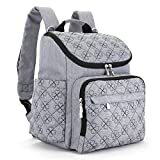 Take for example, these features; insulated milk bottle pockets, easy-access side pocket for baby wipes, a net compartment for towel and a hidden pocket with zipper for keys. The thing I like most about this bag is the magnetic buckle that provides quick access to wipes. On the right side there is an insulated pocket designed to keep the milk warm. You can place 3 milk bottles at one time and the bag can also hold a large 15” laptop. The bag is made out of polyester and includes a diaper changer pad. It comes in two beautiful colors; black and grey. There are separate storage pockets and also an adjustable shoulder strap and top handle. This is another mega entry – a powerhouse with 10 pockets but the best part: it is completely waterproof making it durable and easy to clean. The bag also features matching changing pads and stroller straps. The manufacturer offers 100% money back guarantee. Anything made out of high quality nylon is bound to be graceful. The bag has two side pockets with insulation and two front zipped pockets. There is also an anti-theft pocket that has dual zippers with sturdy built. You can place a small lock on them and keep your items safe and hidden. 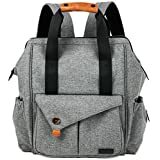 The manufacturer of this bag has placed extra focus on quality of the build. There are strong zippers, good quality material and stitching employed. The idea is to create a bag that is long term, it will withstand our life activities. And it seems to be working. 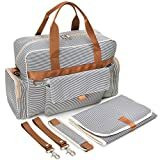 The feedback for this diaper bag by O’beanie is quite good.